Have you ever had such an experience? When you were shaking hands with someone and he or she had a ring around his or her finger and you felt a little pain from the pressure. I want you to imagine that the ring had sharp corners. In such a case it could certainly be used as a weapon. Kakute (角手) is exactly such a type of a weapon which ninjas used. Kakute is a ring that has a few horns around the surface. Basically, ninjas did not like close combat but there were sometimes cases where enemies were standing very short distances from ninjas. In those situations, ninjas used a kakute. They wore a kakute on their fingers with the spiky part facing the bottom of the hand side. If a ninja grasped a wrist or neck of an enemy, the horns would pierce into the flesh of the enemy and the ninja could cause them a lot of pain making it impossible to fight on. This attack would probably not be a deadly blow but it would be enough to give the ninja enough time to escape or continue their raid. 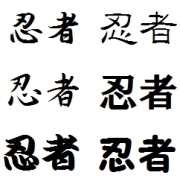 Kakute had various ways of being used. Ninjas could hook a kakute onto the skin of their opponents and tear the skin. 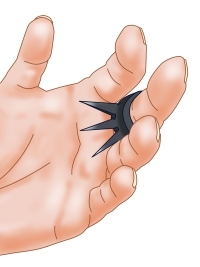 In another way if ninjas wore a kakute with its its spikes facing out instead of in, the kakute could be used like knuckle dusters. Then ninjas could really damage their enemy by just scrap sensitive parts like eyes and ears. Furthermore, if ninjas painted poison onto a horn of the kakute, ninjas could kill their enemy. One thing remains for certain, use of the kakute had great merit for the ninja in that they were portable as they were tiny and light and were easy to use even for Kunoichi (female ninjas).